Simon & Schuster, 9781451676686, 400pp. They had built their lives in this grand old house, its walls encompassing their family and their secrets. Nestled in the sweeping hills they have always known, the house is part of their history, their heritage. But these four walls also hold a secret. When Lord Frampton dies in a skiing accident, a beautiful young woman named Phaedra appears at his funeral—claiming to be the lord’s illegitimate daughter. In his will, Lord Frampton has left the priceless Frampton suite of sapphires to this interloper, confirming her claim and outraging his three adult sons and widow. Eventually, however, Phaedra’s sweet nature thaws the frosty relationships. She becomes the daughter that Antoinette Frampton never had and a wise and compassionate granddaughter to the formidable Dowager Lady Frampton. But an attraction grows between Phaedra and the eldest son, David. It seems an impossible love—blocked by their blood connection and by the fury of one family member who is determined to expose Phaedra as a fraud. 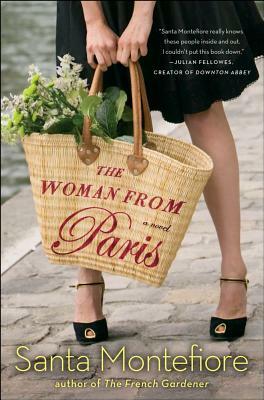 Filled with the luscious scenery and enchanting characters her fans adore, Santa Montefiore’s The Woman from Paris confirms the remarkable power of love to heal broken families and tender hearts. This novel was published under the title The Summer House in the UK. "This novel captivates from start to finish, the plot driven by dark secret, unspoken emotions and a forbidden attraction. The characters are striking and complex, leading to intense and sometimes humorous family dynamics. In rich prose, Montefiore tells an engrossing story about overcoming grief and betrayal to find hope, love and happiness in the most unexpected places." "Montefiore is an able chronicler of family dynamics, making for a skillfully crafted...tale of high society drama." "Themes of remorse, recrimination, and reconciliation imbue Montefiore’s...bright and buoyant romance with a satisfying depth." When the Framptons finally recover from the shock of learning that Phaedra is George’s daughter, most of the family members come to accept her. How does Phaedra win them over? Were you surprised that she was so readily accepted? How would you have reacted to such news? After George’s death, Antoinette realizes “you were everything to me, George, but I was not everything to you.” How does this realization act as a catalyst for change in Antoinette’s life? The Framptons are sure that Margaret will frighten Phaedra, yet the two women find common ground in their grief. Why does Phaedra see through Margaret’s façade in a way that her family cannot? What contributes to Margaret’s irritable nature? How does her nature change over the course of the novel? Discuss David and Phaedra’s relationship. Why are they drawn to each other? Why doesn’t Antoinette say anything when she realizes that David has fallen for Phaedra? Why is Roberta the only Frampton who doesn’t take Phaedra at face value? What would have happened if Phaedra hadn’t inherited the Frampton sapphires? Did you sympathize with Roberta’s suspicions? Or did you think she was merely being spiteful? What motivates Julius? What does he expect from Phaedra? If he truly admired and respected George, how could he act as he did toward George’s family? Antoinette says of the folly: “Someone quite clearly built it with love. It’s only right that we should look after it.” How does this statement apply more broadly to the narrative? In what ways do the characters “look after” each other out of love and duty? Antoinette and Margaret both learn that their husbands had secret relationships. How does each woman handle this knowledge? What enables each of them to move past this betrayal? Discuss the reasons that Phaedra lies to the Framptons about being George’s daughter. Did you think lying to protect the family was justified? Did Phaedra’s longing to belong to a family excuse her continued deception? What do you think would have happened if the Framptons knew the truth in the first place? In your opinion, is lying ever justified? What is your impression of George? How did learning about him through the lens of other characters influence your overall impression? What were his priorities and how did they affect Antoinette, his children, and Phaedra? Do you think he would have changed his will if he had not died so suddenly? In the epilogue, the characters are brought together by work on the estate. At what other points in the novel do outdoor settings act as a source of catharsis or peace? In your own life, when have you found solace in nature? Discuss the theme of forgiveness. What enables the characters to forgive and find peace? Were you surprised at their capacity for forgiveness? What actions would you personally have found most difficult to forgive?